A file photo of social activist Anna Hazare. New Delhi: On the eve of day-long fast to protest against the Parliamentary Standing Committee report on Lokpal Bill, Anna Hazare on Saturday said Government has “cheated" the entire country and that he will carry on his campaign till next Lok Sabha elections to create awareness against UPA. “They have cheated the whole country. The Prime Minister had given in writing that these three issues would be brought under the Lokpal Bill...The Prime Minister’s letter was thrown into the dustbin. Why this volte face? 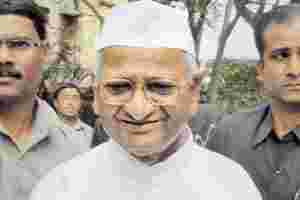 Is Singhvi’s post higher than that of the Prime Minister," Hazare told reporters here. “There is somebody behind... Who is bigger than the Prime Minister?... We suspect Rahul Gandhi could be behind this... Who else can dare to challenge the Prime Minister? That is why there are these problems," Hazare said, alleging that their intentions are “not good". He was referring to Standing Committee headed by Abhishek Singhvi which has disfavoured inclusion of Group C and D employees and kept out Citizen’s charter and Lokayukta. Hazare, who will hold a day-log fast at Jantar Mantar on Sunday, said he will resume his anti-corruption agitation from 27 December and then carry on this for next two years till the Lok Sabha elections. “We will continue to fight for the next two years. We will move around the whole country before the general elections to create public awareness," he said and asked “Why to retain those who have destroyed the country?"